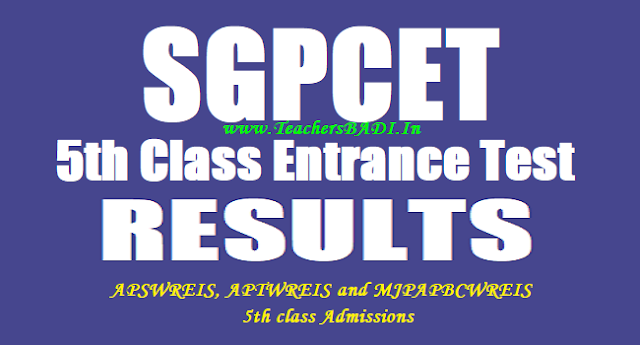 APGPCET APTWREIS 5th class entrance test 2018 results, APTWREIS APGPCET 5th Class Entrance test results 2018, APGPCET APTWREIS 5th class admission test 2018 results, APGPCET AP Gurkulam 5th class entrance exam results 2018, AP Tribal Welfare 5th class entrance test 2018 results, APGPCET FIFACAT Fifth Class Admission test results 2018. APGPCET School Wise Provisional List/APSWREIS, APTWREIS and MJPAPBCWREIS APGPCET 5th class entrance test results 2018: AP Social Welfare Residential Educational Institutions Society issued the APGPCET 5th class entrance exam 2018 notification on March 23 and Online applications were invited from the eligible students from March 23 to April 12 for admission into Class V in all APSWR Educational Institutions, AP Tribal Welfare Residential Educational Institutions and MJPAP Backward Classes Welfare Residential Educational Institutions across the State. APGPCET 5th class admission test was held o April 23 and APGPCET Students are waiting for their results. APSWREIS officials are going to release APGPCET 5th class entrance exam results in this month.